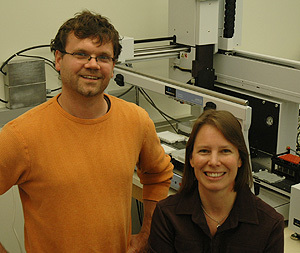 Scott Lokey, director of the UCSC Chemical Screening Center, and associate director Nadine Gassner. Photo by T. Stephens. In its first year of operation, the UCSC Chemical Screening Center has enabled researchers to identify a variety of potentially useful compounds, including promising leads for the development of new drugs to treat infections, cancer, and neglected diseases such as malaria and African sleeping sickness. The center's First Anniversary Symposium on Friday, November 14, will feature presentations by UCSC researchers, a tour of the center, and a keynote address by James McKerrow, director of the Sandler Center for Basic Research in Parasitic Diseases at UCSF. The symposium will take place from 2 to 5 p.m. in the Physical Sciences Building, Room 240. The event is free and open to the public. With an array of robotic equipment and other sophisticated tools for handling and analyzing thousands of samples at a time, the UCSC Chemical Screening Center automates the process of testing chemical compounds for potentially useful biological effects. "We've already found some very exciting leads," said Scott Lokey, associate professor of chemistry and biochemistry and lead investigator of the center. Ongoing projects at the center include screening procedures for identifying compounds that are active against malaria, cholera, fungal diseases, and bacterial infections. Lokey and his collaborators have also discovered a compound that appears to be a more potent analog of a widely used cancer drug. The identification of compounds that could be developed into new drugs is just one of the goals of chemical screening. In addition, biologically active compounds can be extremely valuable as research tools even if they are not promising candidates for drug development, Lokey said. The compounds being tested at UCSC come from a variety of sources, including a large library of synthetic compounds, as well as tens of thousands of natural products derived from marine organisms by UCSC biochemists. "Our marine natural products library is a truly unique collection," Lokey said. "Natural products are generally more potent, more specific, and more exciting to chemists and biologists than commercial compounds." McKerrow's lab at UCSF is collaborating with UCSC researchers Phil Crews and Roger Linington to screen their collections of marine natural products for chemicals that are active against the parasite that causes African sleeping sickness. Crews, a professor of chemistry and biochemistry, has run the Marine Natural Products Laboratory at UCSC for more than 20 years, focusing on chemicals isolated from sponges and marine fungi. Linington's lab isolates compounds from bacteria that live in marine sediments. "The collaboration on African sleeping sickness is still in the early stages, but the results so far are very encouraging. We have products in the pipeline that look promising," said Linington, an assistant professor of chemistry and biochemistry. Linington is also working with Fitnat Yildiz, associate professor of microbiology and environmental toxicology, to find compounds that are active against Vibrio cholerae, the microbe that causes cholera. "The Chemical Screening Center is invaluable to our research," Linington said. "It is allowing us to explore projects and strategies in natural-products chemistry which would otherwise be impractical or impossible." According to Lokey, one of the big challenges has been to efficiently process and analyze the huge quantities of data generated by the center's "high-throughput" screening procedures, which generate tens of thousands of data points from each experiment. Fortunately, a collaboration with bioinformatics experts in the Baskin School of Engineering has yielded powerful computational tools for analyzing the chemical screening data. Joshua Stuart, assistant professor of biomolecular engineering, and graduate student Marcos Woehrmann worked closely with Lokey to develop new data mining software. "Marcos created a nice visual interface on the computer to help people mine their data for useful information," Lokey said. "I had not anticipated how central data mining would be to the screening process, so it's fortunate we had this collaboration." The Chemical Screening Center's First Anniversary Symposium is sponsored by the California Institute for Quantitative Biomedical Research (QB3), the UCSC Division of Physical and Biological Sciences, Agilent Technologies, Perkin Elmer, Collaborative Drug Discovery, and MDS Analytical Technologies. The center is funded by grants from the National Institutes of Health, the U.S. Department of State, and QB3. Keynote speaker James McKerrow is the Smith Professor of Experimental Pathology at UCSF and also holds appointments in cellular and molecular pharmacology and pharmaceutical chemistry. The Sandler Center for Basic Research in Parasitic Diseases, which he directs, is a consortium of core laboratories supporting development of new drugs for global parasitic diseases largely ignored by the pharmaceutical industry, such as African sleeping sickness, leishmaniasis, and Chagas' disease. Note to reporters: You may contact Lokey at (831) 459-1307 or lokey@chemistry.ucsc.edu.